Having escaped the Goblins of The Misty Mountains™, The Company of Dwarves come face to face with another terrible threat! Catapult the Dwarves into the leafy branches of the tall tree where they’ll be safe as Yazneg™ and 2 Hunter Orcs arrive on Wargs and attack! When the Orcs try to burn the tree down, use the tree’s magic flame shooter function to fight back. Includes 5 minifigures: Thorin Oakenshield™, Bifur the Dwarf, Yazneg and 2Hunter Orcs, all with assorted weapons. •Catapult the Dwarves onto the tree to safety! •Shoot the flames with the tree’s magic flame shooter function! •Collect Thorin Oakenshield, Bifur the Dwarf and Yazneg exclusive to this building set! When first looking over this set, one is instantly drawn to the Wargs. This is their first rendition in the Lego universe and the designs are actually pretty good. It would have been better to have a different coloured Warg other than white, as it was ridden by Azog (or include the glorious Azog minfigure we saw from lucky Comic Con guests). Still, it is great to see them in the set. The minifigures are impressive as usual, with great detail. All Middle Earth Lego fans love having more Orcs in their collections, and having an exclusive like Yazneg is icing on the cake (though why couldn't you give him some ears Lego?). Thorin and Bifur look impressive, though Thorin does resemble Kili a little too much for my liking. On top of this, we get a decent sized tree and Pride Rock..... no wait, it is a rock ledge. Throw in some fire elements and we have a great start with this set. Let us first have a look at the minifigures. All minifigures are technically exclusive to this set, though it would be a touch disingenuous for Lego to suggest this as the Orcs compile of parts also found in other sets. Outside of these figures, the set contains no other unique parts. That being said, there are some rarer dark green tiles as well as plenty of foliage pieces for value in parting out. This is a very straight forward build; with the majority of time spend putting the tree together as the rock elements take little time. It isn't complicated though younger Lego fans may require some additional assistance. Onto the playability features, the first aspect we will look at is the tree. Building the lower section of the trunk enables one to create a swivelling device, allowing users to move the tree around for our heroes to attack their marauding enemies. Secondly our tree has this nifty little function that allows our fireballs to be flicked at the enemies below. I am actually grateful they including this, as opposed to throwing unnecessary and inexplicable flick-fire missiles into as set such as 9472 Attack on Weathertop (whichever designer came up with THAT idea really needs to take a long, hard look in the mirror). The small rock ledge also doubles as a catapult for our dwarves to escape or to throw rocks into the trees. Going by the sold listings, the collection totals $38.70, with the current asking prices totalling $43.62. If we consider that the full retail price is $49.99, this is a fantastic return already on a set still easily available with current values returning nearly 80% of the set's value. The question though, is why the disparity between the Warg prices? I believe the reasoning is simply the White Warg didn't feature at all throughout the Lord of the Rings, and is only ridden by Azog in the Hobbit. Making this Warg white as opposed to brown, black or every another gray, definitely hurt the value somewhat. As we can see, compared to these others sets the 79002 Attack of the Wargs set has an increased price per piece, even compared to a set with larger moulds such as the Goblin King. Considering the fact that there are no new elements in this set outside of the minifigures and Wargs, this is disappointing and certainly brings down my rating of this set. This set was released in November 2012 and is still currently available. It is available in many stores and at $49.99 is a bit overpriced which may be difficult for younger consumers to acquire. The front cover art is well laid out, showing the features of the set with the highlight being on Yazneg, the White Warg, Thorin and the tree. Yazneg and the White Warg in particular really stand out, drawing one's attention. The back cover is also neatly designed, with each playability feature surrounded by a map styled border. The Hobbit box art featuring the playability and display features really has been of a high standard thus far. Thus far as a set, it isn't performing that well and selling below retail. In fact, I expect this set to drop further as stores clear it out cheaper freeing up space for new stock, considering the set has only been available for 10 months. That being said, the cheaper price the better the price per piece ratio. We have already seen earlier how much of the set's value is contained with the minifigures and Wargs, so a cheaper price point only makes it more attractive. How far this set can go will also depend on how exclusive the Warg figures remain. If Lego were to issue more in other sets then it could potentially detract from this one. With Orcs and Wargs featuring heavily in the final act of the Hobbit trilogy, there is great potential for them to be included in more sets. There is also the potential of Lego making a Lord of the Rings based set including them so these are factors to consider. Regardless of this, Wargs will continue to be sought after by most Lord of the Rings Lego enthusiasts so will continue to maintain this set's appeal. The Lord of the Rings/Hobbit theme is currently running at 4.91% CAGR. In the long term, I expect it to edge closer to that of a similar theme; Harry Potter. The Harry Potter theme is now discontinued and has a 16.71% CAGR. Expect something similar once these Middle Earth sets have retired. 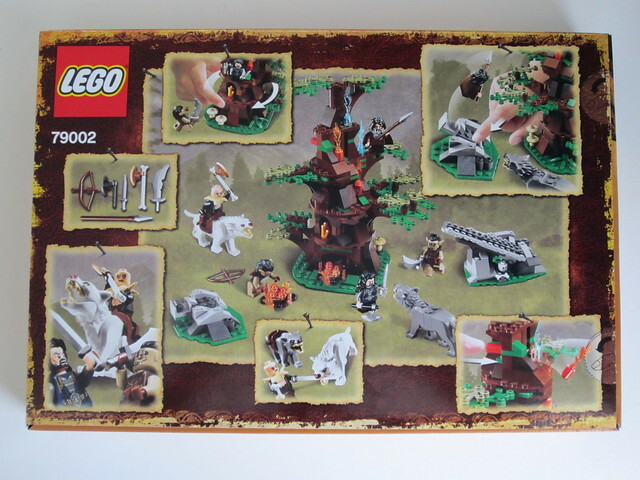 This set really does not display well, essentially being the minifigures and Wargs, a tree and some rock ledges. The best display is having Yazneg and the White Warg on the Pride Rock styled- rock ledge in my opinion. The tree is large enough to attract attention but in reality this setup is a playset surrounding the minifigures and Wargs. As the Hobbit movies roll out over the next two Christmas periods, worldwide exposure to the stories of Middle Earth continues to grow. Lego continue to impress with the level of detail now on minifigures, and the ones included in this set are no exception. 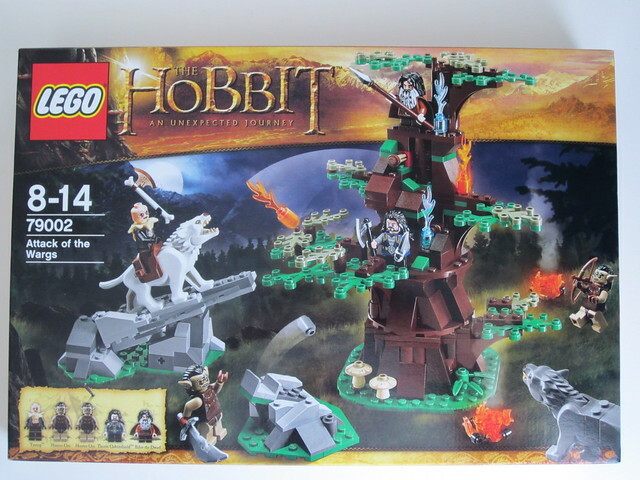 The set is overpriced compared to other Hobbit sets which does detract from its appeal. Those completists currently seeking the entire collection of Thorin's company will require these minifigures in to complete their collection. The tree is good but not spectacular and the rock ledges are average but enhancing this set are the highly sought after Wargs who alone make up over 40% of the set's value. This set will be sought after once it has been discontinued, and it is already possible to find the set at large discounts. Don't miss out on stashing this set aside if you can find it cheap because whilst it might be overpriced now, in the future the Wargs will be something collectors are chasing.